If you look closely at the upper rock "face" you will see a face looking towards the right. Reading the Legend below will help understand the title chosen for this piece. Of all the legends that come from the Ottawa concerning that area of St. Edmunds, the one that tells about the formation of the flowerpots is probably the most famous. 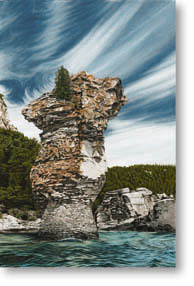 Time and the elements have gradually weathered these rocks to their present shapes and dimensions, but long ago, they closely resembled two human figures and if you look closely at the large flowerpot you can still see a face. The story begins with Shining Rainbow, a princess of the Ottawa tribe, and Bounding Deer, a prince of the Chippewa, enemies of the Ottawa. The two met while the tribes were on peaceful terms at the beautiful Saugeen River near Southampton. They soon fell in love but not a love without complications. Not only were they from different tribes, but Shining Rainbows' mother had promised her to a warrior from her own tribe. War again was also looming between their peoples. So one night in the Moon of the Strawberries ( June), Bounding Deer pushed his canoe away from the shore at Saugeen for the last time. The fact that it was the last time did not worry him for in the centre of his graceful canoe sat Shining Rainbow and she was leaving her people forever. Out on the lake they moved as the canoe slipped like a slim, swift bird through the waters, for the pursuit was expected. For hours Bounding Deer's paddle rose and turned into the moonlight, and when the moon had made the shadows short, they were within sight of Manitoueses. This was a sacred Island off the mainland of the long-point-that-juts-out-into-Lake Huron, as the Indians of the Bruce Peninsula called it. This was the home of the lesser devils and of Little Spirit, and of a thunder bird egg. No Indian who had set foot on this island ever returned. Pausing, they listened to the quiet, and for a moment Shining Rainbow thought she heard paddles behind her. Looking, she saw far behind, three large canoes - and the moonlight gleaming on twenty paddles! They had little chance to outrace the three canoes so Shinning Rainbow offered to through herself over the side of the canoe and swim back to meet her fate, allowing her lover to escape, but he would not listen to her. "It might be that the Little Spirit would have more pity on us than your brothers" he suggested. Shining Rainbow agreed, so when they saw that their pursuers would not fail to take them, they turned straight to shore. No sooner had the bow of Bounding Deer's canoe touched the shore that the watchers in the other canoes felt the waves rise in billows as the result of a mighty upheaval, and their ears were deafened by a loud crash. When the canoes were steadied again, it could be seen that the island had been split in two! There on the shore were the petrified figures of the two they had followed. The Little Spirit had once again spoken to his people!